Unique Audience: Sea Lions & Students! 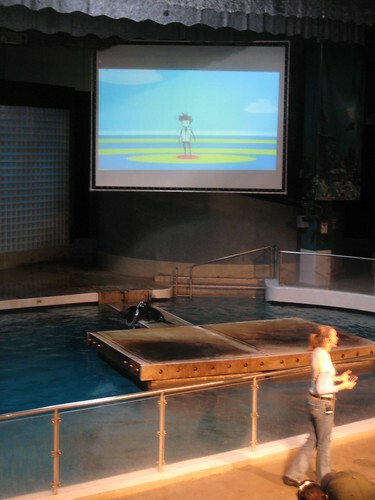 Last Saturday, I got to do the ACE presentation at the Mystic Aquarium in Mystic, Connecticut, RIGHT IN FRONT OF THE SEA LION POOL!! It was super cool!! The students - and the sea lions - were a great audience, clapping, cheering, and making quite a ruckus! The sea lions got pretty enthusiastic about raising their voices when I got to the DOT section, telling all of us about their commitments - or probably their need for us to commit - to take on climate change by barking through the whole section. Why was I doing this crazy presentation? ACE was the featured speaker at the Keep Connecticut Cool Conference, a conference for youth teams competing on the awesomeness of their green projects in Connecticut. Pretty sweet! There were students from over 20 schools at the event, plus the 4 adorable sea lions, at the event. The sea lions spent their day performing, eating fish, and wowing visitors with their swimming skills; the students spent the conference learning how to design successful green projects and hearing from groups that have already done amazing things - ranging from composting, to reusable lunch trays, to raising money to buy rainforest land in S. America. Go Connecticut Climate Rockstars! Lead the way to a clean, green future! The sea lions will thank you! !